Teach how to play piano for kids with our easy piano lessons for kids. 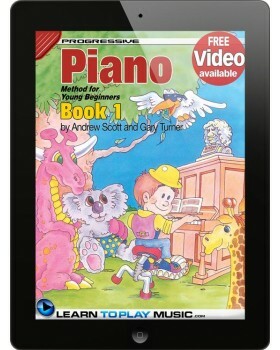 Progressive Piano Method for Young Beginners - Book 1 contains all you need to know to start teaching kids to play piano - in one easy-to-follow, lesson-by-lesson children's piano tutorial. Suitable for children aged 4 to 8 years and all types of pianos including electric pianos, digital pianos and piano keyboards. No prior knowledge of how to read music or playing the piano is required to teach a child to learn to play piano from this book. 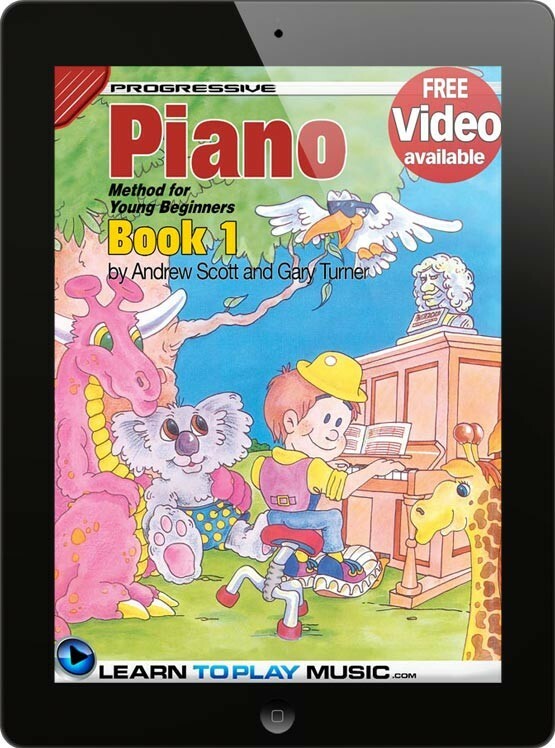 Contains everything you need to know about how to teach a child to play piano today. Kids piano lessons have never been this easy for parents and teachers who want to teach children to learn how to play the piano, fast. LearnToPlayMusic.com's piano lessons for kids are used by children's piano teachers worldwide to teach how to play piano for kids. For over 30 years, our team of professional authors, composers and musicians have crafted piano lesson books that are a cut above the rest. We offer a large selection of music lessons for kids that cover many different instruments in print, eBook and app formats. Awarded the 'Quality Excellence Design' (QED) seal of approval for eBook innovation, LearnToPlayMusic.com continues to set the standard for quality children's music education resources. Excellent material for the 5 - 6 year old beginner! The first five right hand notes are presentd first, along with instruction in time valuues of the quarter note, half note, and whole note. With each new note, the position on the staff is clearly pointed out, as well as the corresponding location on the keyboard and the finger with which it is played. (There are diagrams of the keyboard on which the relevant note is highlighted clearly, as well as drawings of the hand with numbered fingers). The instructions are clear and straightforward. The same holds true for the first five left hand notes. More musical concepts, such as the whole, half and quarter rest are introduced. The lead in bar and the repeat sign are also learned.